MAZDA CX5 BOOT LINERS come with lipped edges and anti slip centres. Keep your car protected. Uk stockist. All are liners are waterproof and can be washed with a hose pipe. Get one today before damage occurs. 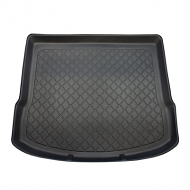 Unlike universal boot liners our liners follow the contour of the boot floor exactly giving a snug fit.